We're a non-profit media foundation on a mission to inspire people to restore the Sacred. Learn more about us. 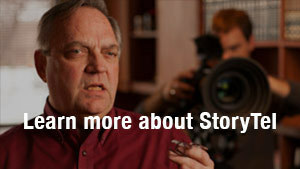 Watch StoryTel videos. Support a film project. StoryTel is a non-profit media foundation on a mission to restore the sacred. Join us on our mission to restore the Sacred. Here are three ways to help. Share our books and DVDs with family and friends. We believe in the restoration of the sacred and the growth of the Catholic faith. Our aim is to bring truth, beauty and goodness into through through Catholic film production and our unique Catholic Catechism books. Sometimes referred to as StoryTell, StoryTel Foundation is a 501(c)3 non-profit film and book publishing company on a mission to inspire people to restore the sacred. We adhere to the teachings of the Catholic Faith, and are committed to the highest quality film and book production standards. Contributions to StoryTel are tax-deductible. Keep in touch with StoryTel by receiving email updates or following us on Facebook or Twitter.